After visiting friends in Portland and Corvallis, Oregon, I flew via Alaska Airlines to Vancouver, B.C. on April 28. I was pleasantly surprised to find an information desk at the airport strategically located near baggage claim. I was very pleased to find an actual human posted there to answer questions and direct arriving passengers to their destinations via different modes of transportation. Within moments, I bought a ticket and boarded the light rail at the airport to downtown Vancouver. In twenty minutes, I arrived at a stop within walking distance of my hotel, Sunset Inn on the West End. I had two smallish bags, thankfully, both on wheels. After checking in, I continued to explore the city on foot. Vancouver is a breathtakingly beautiful and cosmopolitan city that has managed to retain a small town feel. Don’t get me wrong. Vancouver has its share of chaos, mostly due to an ongoing construction boom reminiscent of San Francisco’s. Yet, despite detours and traffic jams, people for the most part seemed friendly and relaxed. With only three days in Vancouver, I had to make choices about what to see and do. 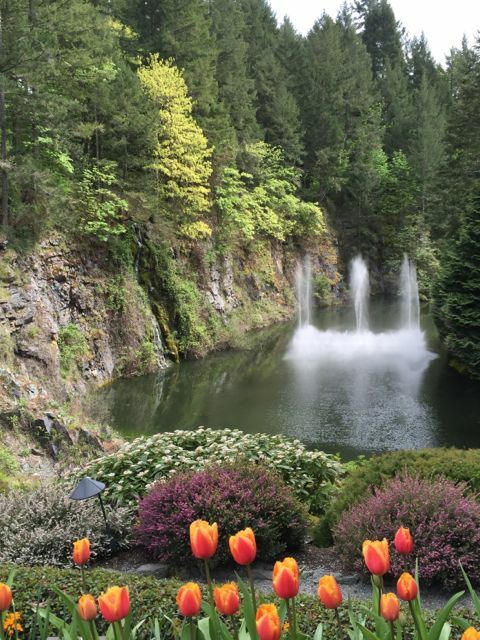 I decided to visit Butchart Gardens, a private, world-famous garden located on Vancouver Island. This is an all-day trip. The ferry takes about 90 minutes each way, but I needed to get clear across town to board it. I found a bus that ran directly from the train station to the ferry. On the bus I conversed with a woman who was a yoga instructor from the nearby town of Kamloops. We talked about the upcoming election in Canada, the Keystone Pipeline and climate change. She said that rural British Columbians were responding to climate change by slowly transforming their ideas and actions about resource management, even if the government was dragging its feet. She noted the influence of the Canadian philosopher and writer David Suzuki and his organization, Bluedot.org in effecting this transformation. Vancouver Island ferries are monster ships, designed to transport buses, trucks and cars, as well as hundreds of passengers. There were restaurants and large open lounge areas, and you could walk around the observation deck. After disembarking from the ferry on Vancouver Island, I caught another bus to Butchart Gardens, For a Californian used to brown lawns and parched landscapes, the lush green Butchart Gardens, with its millions of tulips and hundreds of dogwoods in full bloom, seemed like Fantasyland. The next day I dedicated to Granville Island, which is a sort of island within the city of Vancouver. I walked a few blocks from my hotel room to catch the Granville Island passenger ferry, a 20-foot long vessel that shuttles people back and forth in less than 10 minutes. Granville Island is known for its shops, restaurants, music venues, and public market. On my last day in Vancouver, I took the bus to the University of British Columbia’s Anthropology Museum, which contains one of the world’s finest collections of First Nation artifacts, including totem poles and other elaborate carvings. The docent at the museum impressed on us that these artifacts were donated entirely by First Nation tribes. She explained that the UBC Anthropology museum, unlike many other museums in the world, has a policy of never accepting pieces that had been obtained through plunder or theft from native peoples. That afternoon, I checked out my hotel and went to the VIA Canadian Railway Station in Vancouver, to begin my trans-Canada trip via Jasper National Park to Toronto. I had time to kill, so I hung out at the A&W Root Beer located inside the train station. It was the only place in the station where you could plug in your laptop and use their wi-fi. I’m grateful for the time I spent on-line at the A&W, because VIA Canadian Rail does not offer wi-fi on most of their trains. I was about to be...gasp...cut off from internet and phone service for an entire day, until I reached Jasper.